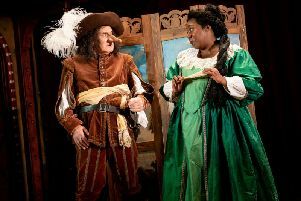 Expect a night of laughter and frivolity when one of the leading Gilbert and Sullivan Groups comes to the area next month. The Wandering Minstrels will be performing at All Saints Church in Clipston on Saturday, May 6. The group, who perform concerts across the country, will play a light-hearted evening of songs and scenes from the Gilbert and Sullivan comic operas. It will feature an evening of Savoy favourites, combining the wit of W.S Gilbert and the enchanting music of Sir Arthur Sullivan. The Wandering Minstrels is a highly accomplished group of six singers and their concert pianist. Their concerts are presented in period costume and performed in traditional style. The company has raised many thousands of pounds for numerous charities since its formation in 1992. They have performed in theatres, churches and stately homes all around the country and have often appeared at the prestigious International Gilbert and Sullivan Festival in Buxton. The performers will include sopranos Charlotte Clement and Alexandra Honey as well as mezzo soprano Emma Louise Stratton. Tenor Charles Mills, baritone Ralph Mealey and bass Tim Hurst Brown join pianist Peter Hewitt in completing the line up. Doors open at 6.45pm for the reception, with a complimentary glass of bubbly, canapes donated by Emerson Wests and nibbles donated by parishioners. The performance starts at 7.30pm with one interval when there will be a bar available to purchase drinks. Bottles of red or white wine for the interval cost £10 each. These can be booked and paid for in advance with tickets. Tickets for centre aisle seats cost £12.50 and side aisle seats are £10. Tickets can be purchased by calling Julie Connell on 01858 525336 or by emailing j.connell118@btinternet.com. Proceeds from the event will be donated to the upkeep of the venue. For further information about the performers and their forthcoming concerts visit www.wanderingminstrels.org.uk.